We bring you a very easy to use app that persuades you to online shop while you are drunk known as Drunk Shopping. 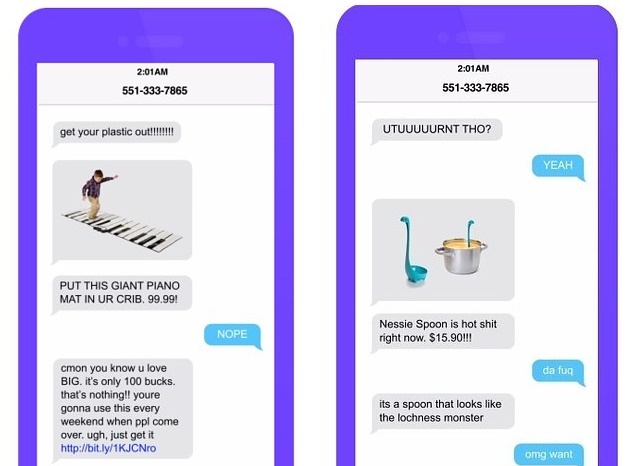 Drunk Shopping is invented by Chris Baker, a former Buzzfeed advertising employee. Previously they succeeded in making websites like Unbaby me (a supplement browser that substitutes the baby photos on Facebook with pictures of cats) and Troll the NASA (a template email filled with terrorism keyword to jam up the NSA’s servers). Drunk Shopping is more of a fun app. Partying on Saturday night made you forget to buy gift for your girlfriend’s birthday or something really important you needed to buy as you have gulped down too much of Antiquity or Jack Daniele? Well, don’t worry as we bring you the perfect app that will help you to make bad commitments. At exactly 2 a.m. on Saturday night you will get a message with a link to a dumb/bad/regrettable thing to buy online and you will have to make the ultimate decision whether to buy or not and surprise to your sober self. To subscribe it you have to text “heyyyy” (the standard number of y’s to signify your bad text choices) to the phone number 551-333-7865. If you need to unscribe it, you will just need to type ‘STOP’ and they will chill out. But they don’t cut of the sales of any dumb objects you choose to buy. Bunker has announced recently that he doesn’t brood over taking benefit of drunken shoppers through Drunk Shopping. “We feel great about it. Although most of the time we’re sure people won’t be completely hammered, they’ll still have a great experience just seeing what product we choose and how we write about them”.